Let LIE be the acronym for Latinos In Education. Indeed, our public schools today need and want as many LIEs as possible. Truth be told, LIE as an organization is fiction at this time, but what is real is the increasing involvement of Hispanics in public schools; and that is a good reason to feel optimistic. The Metropolitan Nashville Public School (MNPS) system has experienced very high growth in the number of Hispanic students in the last decade. The statistics and points of reference below are just a handful of so many relevant issues directly connected with population shifts and ethnic composition in our schools. 1. 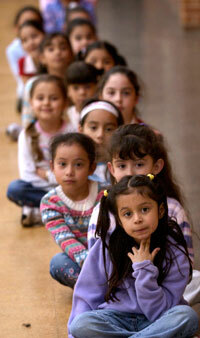 In 1996, Hispanics students in MNPS accounted for just above 2%. Last year 14% of students were Hispanic, that is one out of every seven. 2. Geographically the MNPS system is divided in 13 clusters. Five of them: Antioch, Glencliff, McGavock, Overton and Cane Ridge consolidate 85% of the Hispanic student population. 3. From a depressing and demoralizing 50% in 2005, the high school graduation rate for Hispanic students in Metro Nashville raised to 54% in 2007. 4. Unconfirmed estimates indicate that less than 5% of Hispanic students in Nashville live under the care of a head of household who is a registered voter. 5. There is a direct correlation between an active Parent-Teacher Organization or Association (PTO/PTA) and momentum for positive change in its school environment. Not quite half of all MNPS schools currently have a PTO or PTA in existence. A total of only eight schools last year had Hispanic parents as board members of their PTO or PTA. 6. There are ethnic gangs in public schools in Nashville. Anecdotal information consistently indicates that the parents or guardians of the active Hispanic gang members are not the first to recognize or acknowledge the student's involvement. 7. National statistics indicate that half of Hispanic minors are raised in the absence of one or both biological parents. Without over-stretching the figures, it is a good approximation to assume a similar ratio at the city level in Nashville. 8. The law mandates compulsory attendance for grades K-12, be it a formal school setting or home-schooling. What may merely sound as an obligation is also a priceless right: every child in Nashville is entitled to attend public school regardless of race, ethnicity, nationality or immigration status. Lack of conventional or legal documentation is no excuse for any child 18 or younger, Hispanic or not, to prevent enrollment in the public school system. 9. Despite the fast increase of Hispanic enrollment in MNPS, we are still waiting for the day when a public school in Nashville will get its first Hispanic principal ever. So, where are the LIEs, and how significant are they? In terms of being formally organized, Hispanics generating change in public education are directly and deeply connected with the organizations listed below. [a] Comite de Padres Latinos (COPLA), under the leadership of Ernestina Gonzalez. [b] HispanicAchievers of the YMCA, under the leadership of Jessie Van De Griek. [c] Conexion Americas, under the leadership of Renata Soto. [d] Nashville Area Hispanic Chamber of Commerce, under the leadership of Yuri Cunza. [e] Tennessee Hispanic Chamber of Commerce, under the leadership of Ramon Cisneros. [g] Middle Tennessee Hispanic Democrats, under the leadership of Fabian Bedne. Aside from formal organizations, I feel personally proud of the hundreds of public school Hispanic teachers and parents that day after day make their presence noticed and do not hesitate to have their voices heard despite barriers or differences in language or socio-economic status. I wish there were enough time and space to list each of them by name, but I feel happy to have seen, heard or shaken hands with so many of them. I sincerely hope that items 1 through 9 above move you to reflection and action. I also encourage you to connect with any of [a] through [g] above at your earliest convenience. Our children – Hispanic or not, and especially during their school years - are thirsty for trustworthy and caring adults who will listen and be available when most needed. Their education is the best inheritance we can leave to them (not my words but practically a mantra among parents – Hispanic and non-Hispanic), and in terms of creating change and improvement in public education procrastination cannot be an option: “if not us, who? ; if not now, when?”. Cesar Muedas served as first president of COPLA, the Committee of Hispanic parents (Sep.2006-Sep.2007) and was the only Hispanic member of Mayor Dean's workgroup for the Project for Student Success (Dec.2007-Jun.2008).